For the chermoula paste, blend all of the paste ingredients, except the salt and cayenne pepper, in a food processor until smooth and well combined. Season, to taste, with salt and cayenne pepper, if using. Spread the chermoula paste liberally all over the salmon fillets. Cover and set aside to marinate for as long as possible, and up to an hour if time allows. Heat the oil in a large, non-stick frying pan over a medium heat. Add the onion and red peppers and fry for 3-4 minutes, or until they start to soften but are still intact. Add the wine and bring the mixture to the boil, then reduce the heat until the wine is simmering. Simmer for 2-3 minutes, or until most of the wine has evaporated. Add the tomatoes, reduce the heat slightly, and cook for 4-5 minutes, or until they start to break down. Stir in the basil and lemon zest. Cut four large pieces of baking parchment or aluminium foil – each needs to be large enough to wrap a fish fillet. Brush or spray each piece of parchment or foil with a little vegetable oil, then place one chermoula-coated salmon fillet into the centre of each. Place a slice of lemon on top of each fish fillet. Spoon one-quarter of the red pepper and tomato mixture alongside each piece of fish. 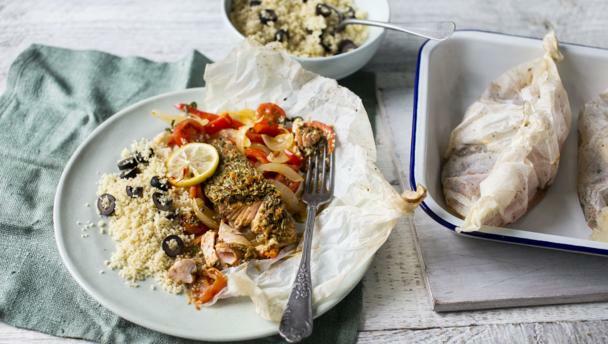 Neatly wrap the fish parcels by bringing the opposite edges of the parchment or foil together and folding to seal on all sides. To serve, place the unopened parcels onto serving plates. Allow each person to open their own parcel. Serve with a large bowl of steamed couscous and a few black olives. Les Richoises Grenache Cinsault Rosé, Domaine La Chautarde Rosé 2013 Côteaux Varois en Provence or Tilmuqui Single Vineyard Fairtrade Malbec Rosé 2014 Famantina Valley, La Rioja, Argentina.